I first developed my love of lettering during my graphics course at college. With the help of my tutors I taught myself basic calligraphy and was lucky enough to be accepted straight from college into the David Kindersley Workshop, where my lettering skills were sharpened and I was taught to carve letters in slate and stone. After leaving the David Kindersley Workshop I went on to work with Tom Perkins for about 8 months. 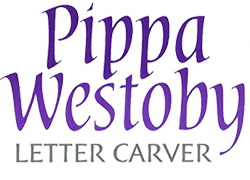 In 1997 I joined Ivett & Reed as their Letter Carver. I worked there for five years, and in that time I carved a great number of interesting and rather challenging stones - and not all to my liking! I am now self-employed and with the help of Memorials by Artists, Cambridge Open Studios and Byard Art, my business is going from strength to strength. My work consists mainly of commissioned Memorials, although I also carve lettered garden ornaments, house plaques and signs, or anything that involves lettering in stone! NAMM Natural Stone Show Awards 2000 - Won ‘Best Slate’ and ‘Lettering Craftsmen’. 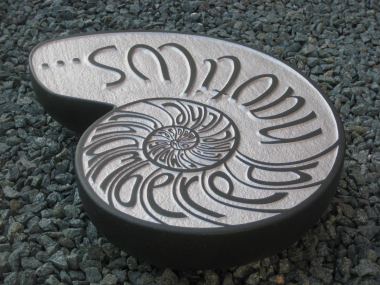 Exhibition piece carved on Green Slate. ‘Inspired by the word’ - The Jane Austen 200th anniversary exhibition, in Hampshire. Korean War Memorial (2014) - Lettering on the Portland stone obelisk. Chelsea Flower Show (2009) - Lettering on two panels in the QVC garden by Adam Frost. David Lloyd George Statue in Parliament Square (2007) - The lettering on the plinth. Bronze profile memorial plaques of King George VI & The Queen Mother in Sandringham Church, set into Portland stone (2003) - The lettering on the stone around the edge. Sherlock Holmes Statue outside Baker St Tube Station (1999) - The lettering on the plinth.